Fairplay Benalup Golf is situated in a unique environment with stunning views over the, La Janda, valley and the, Los Alcornocales, natural park. Playing golf has to be a pleasure, exclusive but still affordable, with respect for etiquette. Therefore we have chosen for a very limited number of players per day in a pleasant atmosphere on a course where nothing is left to chance. 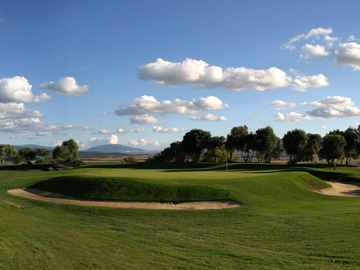 Fairplay Golf Course is the result of the collaboration between several professionals. The course has been designed by the architect Baron Paul Rolin, a former partner of Robert Tend Jones. The all-inclusive green fee makes Fairplay Golf and Country Club unique. The green fee includes breakfast, refreshments on the course, a 3-course lunch and drinks. Otrolig högstandard. Kontakta vårt kontor för golfpaket på deras hotell eller villor.